Something improved for me when Lana Cattivo moved in next door. I guess you'd have to call it something else, desire, since lust wasn't entirely accurate. But then, neither was love. Not by a long shot. From Thriller and Shamus Award winner Vincent Zandri comes a thriller that shows danger doesn't need to find you - because it's already right next door. The apple trees are fertilized with evil, and the backyard fences aren't enough to stop the manipulative mind games and dangerous lies. The lines between good and evil are blurred, and then erased, as Ethan does what it takes to survive. 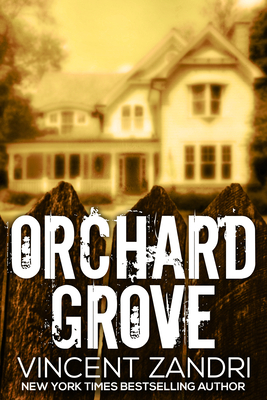 Orchard Grove is a thriller from a writer lauded as one of the very best working today, that will keep you turning pages long into the night. Vincent Zandri is the New York Times and USA Today best-selling author of more than 16 novels including The Innocent, Godchild, The Remains, Moonlight Rises, and Everything Burns. He is also the author of numerous Amazon best-selling digital shorts, Pathological, True Stories, and Moonlight Mafia among them. Harlan Coben has described The Innocent as '"gritty, fast-paced, lyrical and haunting," while The New York Post called it "sensational . . . masterful . . . brilliant!" An M.F.A. in writing graduate of Vermont College, Zandri's work is translated in the Dutch, Russian, French, Italian, and Japanese. Recently, Zandri was the subject of a major feature by The New York Times. He has also made appearances on Bloomberg TV and FOX News. In December 2014, Suspense Magazine named Zandri's The Shroud Key as one of the best books of 2014. A freelance photo-journalist and the author of the popular lit blog, The Vincent Zandri Vox, Zandri has written for Living Ready Magazine, RT, Newsday, Hudson Valley Magazine, The Times Union (Albany), Game and Fish Magazine, and many more. His novel Moonlight Weeps has been nominated by International Thriller Writers (ITW) for the 2015 Best Paperback Original. He is a resident of both New York and Florence, Italy.